Lock Guide that we offer provides secure locking support to sliding windows in closed/ventilating position. We are listed among the top Manufacturers, Exporters and Suppliers of Lock Guide. We make available Lock Guide in standard & OEM construction options. 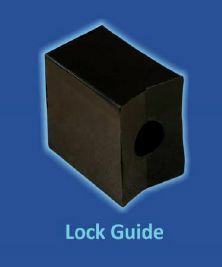 The best thing about our Lock Guide is that it is designed and developed as per the set industry standards. It can be obtained from us at the best market price.